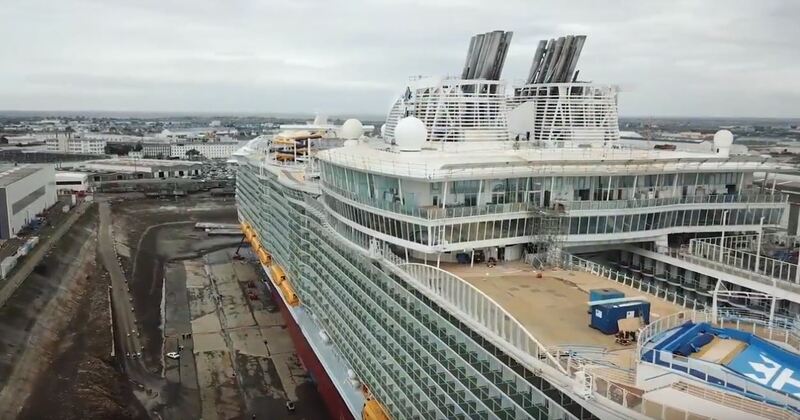 Watch this stunning drone footage of Symphony of the Seas at the shipyard while workers take their final photos. The world's largest cruise ship is just about completed and ready for service. Not long to go until Royal Caribbeans newest cruise ship which we must add will become the largest cruise ship in the world too. Symphony of the Seas is now receiving its final touches and preparing for its maiden voyage in March 2018. The cruise line has put together yet another stunning video of the cruise ship while at the STX France shipyard and you’ll get to watch it further down below. So now that Symphony of the Seas is just about ready service do expect to see a ton of new videos, news, and images of the world’s largest cruise ship. In the new video by Royal Caribbean, a final photo shoot takes place of the workers as stunning drone footage captures the memories while hoovering all around the fourth Oasis-class ship. The ship looks huge! Are You Ready for Royal Caribbean Newest Cruise Ship? At the moment crew members are starting to arrive to get the ship ready for the first passengers in March. Most of the work is complete and the vessel past recent Sea Trials perfectly. You can see how far the ship has come along by viewing these recent construction photos. The 230,000-ton cruise ship will set off on her maiden voyage from Barcelona, Spain on March 31, 2018, and when she does it will make history and overtake sister ship Harmony of the Seas as the biggest cruise ship in the world. The vessel will spend some time sailing in Europe before finally arriving in Miami, Florida for Caribbean cruises. There are lots to look forward to for Symphony of the Seas including the handover ceremony from STX France shipyard, first maiden voyage, naming ceremony and the ships first arrival in the United States. Cruise Hive will be here to keep you informed as usual.